West Brom midfielder James McClean revealed he has received death threats – and insists he is not anti-British. The Republic of Ireland winger faced criticism in the past for refusing to wear a a remembrance poppy on his jersey and for deciding not to represent Northern Ireland at international level despite appearing for them at underage level. However the 28-year-old insisted he never had any intention of playing for Northern Ireland at senior level. "Back in Derry I was just being me. Nobody cared," he said. "All of a sudden things I say are in the papers. I'm still the same person I am - I wouldn't want to change. If you like it, you like it, and if you don't, you don't. "It's in the papers that I'm pro-IRA and the way it goes, if you see something in the paper you believe it whether it's true or not. I've been very lucky with my managers, they've believed my side of the story. 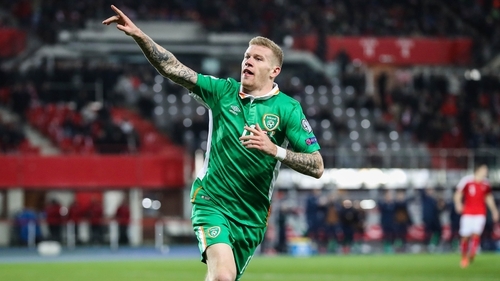 "I've had death threats and I've had a lot of people see me as anti-British," said McClean, speaking on BBC’s Football Focus on Saturday. "I want to go on record here and say I've never been anti-British. There's certain things that I don't agree with, my beliefs, but I take people at face value. "I've had a lot of death threats which started when I declared myself for the Republic. I played for Northern Ireland for the youth system - I never hid from the fact that I took advantage of that system to better myself but I never had aspirations to play for Northern Ireland. "I was getting death threats for declaring for my country." McClean's refusal to wear the poppy for the first time in 2012 saw him booed by Sunderland fans - something he admits hastened his exit from the club. However, the former Wigan player is now enjoying his football again under Tony Pulis, having scored five goals in 38 appearances this term. And he believes Pulis deserves much of the credit for his impressive campaign. "I was on the verge of signing for New York Red Bulls," he added. "But for me I could turn down New York, I could not turn down the chance to play in the Premier League again. "He (Pulis) outlined his plans for me and for the club and it was a no-brainer. Having a manager that believes in you - there's no better feeling."